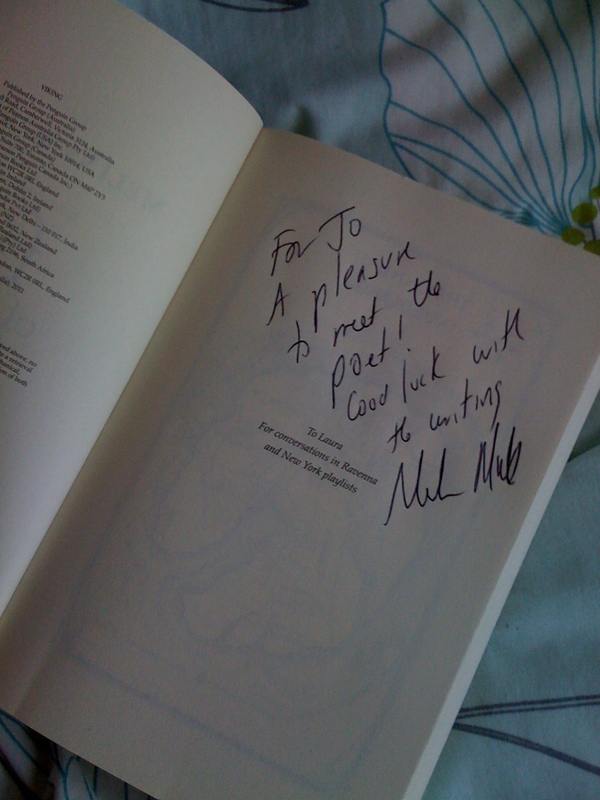 Or… how I met one of my all time favourite authors. If you are a fan, you will probably know that Melina Marchetta is travelling Europe to gather the last bits of research for the third book in her Lumatere Trilogy, Quintana of Charyn. Just before Christmas, MM sent me an e-mail asking if I would like to meet up with her while she was in London, I sort of stared at my laptop for a moment before making this high-pitched squealing noise that I don’t really want to talk about agreed immediately. I thought it would be an amazing opportunity to write an extremely intelligent article about what it’s like to be a best-selling author that will provide advice and insider knowledge. Um… unfortunately because it’s me…you’re probably not going to get an extremely intelligent article about what it’s like to be a best-selling author that will provide you with insider knowledge. We met outside a pub near Oxford Circus and Double M came in just the nick of time as one of those street-sellers was making crazy eyes at me. Then we walked to a delicious Scandinavian café and we set up camp. Of course, I asked her about Quintana of Charyn and MM assured me that Q is just as eccentric as she was in Froi and that she’ll be definitely making some waves amongst the characters and relationships. AND when her and Isaboe finally meet… well, it’s going to be intense and I’m so excited. I just have the best mental image of Finn and Froi exchanging a glance and taking a step backwards, leaving the ladies to it. I can tell you that the prologue will be in 2nd person and MM told me the first four lines (which I can’t remember because I was too busy staring at her in awe and thinking that this was the best audiobook in the world) and I got goose bumps. And then we talked about the Jellicoe film script and she told me about the final scene and… wow. I’m not telling you how it ends but I almost teared up in a Scandinavian café. That’s how good it sounds. It is quite different to the book and there are a fair few things that have been taken out or altered, but I think anyone who has read the book will know how difficult it would be to adapt it. The three main threads of the book will definitely be there. Webb and co, the territory wars and Taylor and Jonah. Yes, they will all be there and they will be breaking our hearts like they did in the book. Also, you know how all of MM’s characters kind of have a companion character? e.g Lucian and Tom Mackee- deep down wonderful guys who just need to keep quiet and also well fit. Well Sam, the young boy in Jellicoe that Taylor and Jonah see in Sydney, was the basis of Froi. I never really thought about that before but I can really see it. I did ask her about a Jimmy book because it would be unfair to my loyal readers not to. I wish I had better news! I think a Jimmy book set in Ireland would be brilliant. And Tom could be there. Maybe even Finn and Froi…. And they couldn’t leave Lucian behind, could they? They could just go on a lad’s holiday in Ireland. Then Melina Marchetta, award-winning author, asked me about my own writing and I blushed and floundered and stuttered and then I told her that I was writing a piece about…. Aaaaand that’s a story for another time. Unfortunately, Double M had to make a move because she was catching a flight to Guernsey to meet friends. And then back to London to catch a train to Paris where she will be going around Provence. Then after Provence, Double M is off to meet Kristin Cashore in Rome. Yep, that Kristin Cashore. Best-selling authors, gallivanting around Italy. Unfortunately, I’ve never read any of Ms Cashore’s books but I have been told by pretty much everyone that I have to, so I will be remedying that pronto. Oh to be an author, eh? I also asked her to put in a good word for me to Tom. And she smiled politely and the subject was changed swiftly. Then she signed my copy of Froi. And then she helped me navigate the Underground. “Um, Jo… they’re the easiest thing in the entire world” I hear you say. Well, yes, but I’m a Mancunian and I like my transport strictly above ground. 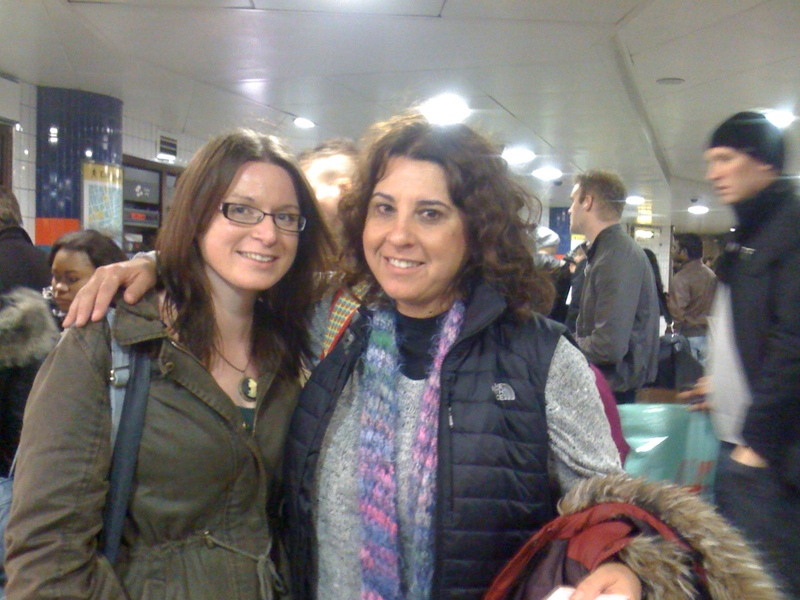 I also made her pose for a picture while we were at Oxford Circus….at rush hour…. On a Friday. But we figured that seeing as we were both technically tourists, it was fine. All in all it was an absolutely fantastic day and even the fact that my Kindle got smushed somewhere along the line did not wipe that silly smile off my face for the whole weekend. My Favourite Authors I Would Like To Meet- UPDATED. Philip Pullman– Bangor. Um, well…OK, so I haven’t exactly met him but I’ve been in the same room as him twice (he has an honorary degree at Bangor University and did lots of fascinating speeches and readings. I was too shy to go and speak to him though, so I may or may not have hid behind a pillar. Yes, Mr Pullman, that was me)… so that counts, right? Just one more to collect now…. Here’s looking at you, Ms Rowling. I love that you were able to meet Melina, lucky lucky you! I third and fourth everyone! This is wonderful and so feel good Jo. PS – who's the hottie in dem specs?? Seriously, you're a cutie. Wow! I love this post. LUCKY you! I am so jealous (and you've seen Phillip Pullman too – the jealousy grows!) although I probably wouldn't have been able to speak to MM so good that it was you and you have such great info to share. I just finish Froi and I adored it, I can't wait to Q of C. I mean the ending of Froi was a shocker! I especially can't wait to see Isaboe and Quintana together. Sadness that there is no Jimmy book in the works yet, I want to see visit Francesca and co again (Saving Francesca remains my favourite MM book). Thanks for sharing this and sorry about your Kindle, oh and the tube is baffling to me too! YOU MET MELINA MARCHETTA IN PERSON! I am so jealous. I was happy enough that she replied to my email, I can't imagine what it would be like to actually meet her. She sounds like a lovely person. Lucky you, you've met so many of your favorite authors. Thanks for sharing with us details of your meet up, I enjoyed going through them. You've got to read Kristin Cashore's books! They are amazing fantasy novels and she's one of my favorite authors. I don't know how I missed this post when you fist put it up. Oh right, it was probably because I've been being a horrible friend lately and not keeping up with my favorite people! BUT, this entire day sounds fabulous and I'm so happy that you got to meet someone from your ultimate author list:) I hope Jimmy starts speaking to her sometime during my lifetime. Oh, and I really want to know how the Jellicoe script ends! Great post, Jo! « Interview with Zack Ahern, Photographer.